Hollybeary Creations : NND February Release Sneak!! 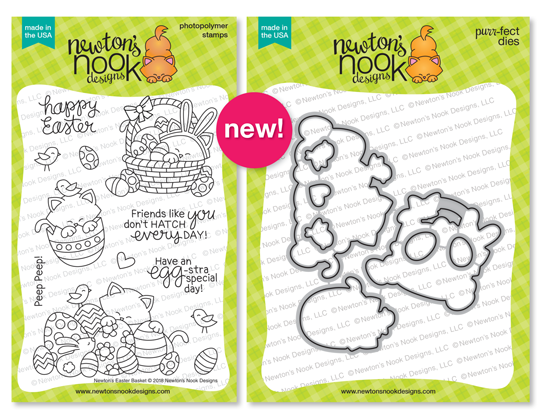 Happy Monday everyone... Are you ready for a peek at the February Release from Newton's Nook Designs? This release if full of Fun images perfect for Easter and just to say Hello! Hop along with us and be sure to leave comments along the way for a chance to Win!! Today we are introducing a new Stencil to the line called Cloudy Sky and the Super Adorable Newton's Easter Basket stamp and coordinating die set. I started with a piece of Distress Watercolor paper and I added some Salty Ocean Distress Oxide ink. Once that was dry I added some White embossing paste with the Cloudy sky stencil. I made the clouds thick with some texture. Then I set that piece aside to dry, you can dry with your heat gun if you'd like. I die cut two more pieces of watercolor paper using the banner from Flags and Frames die set and the Land Borders die set. I added some Lucky Clover and Lemonade Distress Oxide inks to the pieces and set them aside to dry. I stamped the Newton image onto some watercolor paper with Ranger Archival Ink. This ink is great for watercolor when you don't heat emboss your image. I colored the image in with Distress markers and an Aqua brush. Then I used the coordinating die to cut it out. 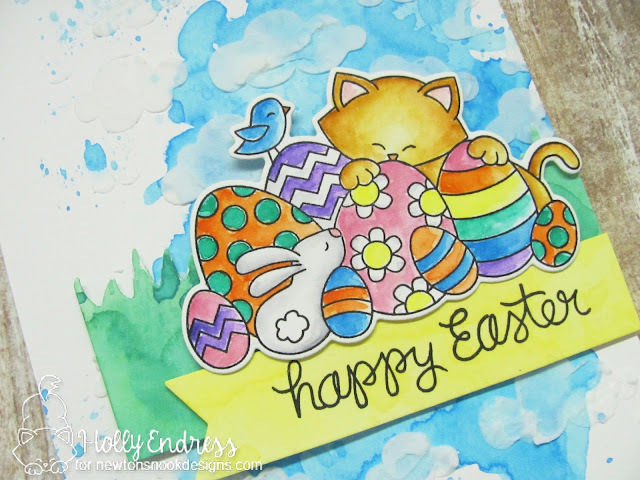 I cut apart the Happy Easter stamp so I could stamp it in a straight line using my Misti. (Don't worry if you cut your stamps they will go back together and stamp just like new ) I adhered the image over the grass and then added the sentiment banner under the image just a bit. I added so foam tape to the back and adhered it to the right side of the card and trimmed off any excess hanging over. So cute... This set is full of great images perfect for Easter!!! Your watercoloring is fabulous! I love the way you used the stencil clouds, and vellum! Very cute scene, Holly. Love how you did the BG w/c and the cloud stencil. And of course, the new set is just adorable & sweet. Pretty coloring and background! Love Newton's Easter Basket! Such a fun stamp set! How adorable!! Your water coloring is awesome! Just love your coloring and background. I am in love! I love the background! I'm a little surprised at how subtle the clouds turned out on that background, but I really love how it looks. It's the perfect accompaniment to that cute image. Thanks for sharing with us! Great coloring and love your stencil clouds. Love your background! Great card! So sweet! This card is adorable! I love the little scene you created with this new release! Love your splash of color. This is such a cute stamp! I love the background of your card! Very cute card. 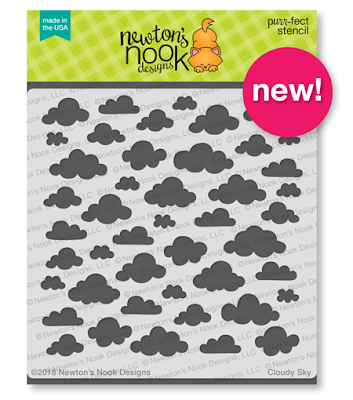 I love your watercolor background with the clouds using the stencil. I really like the background of your card! Very cute! That watercoloring is so fabulous! I adore this card! 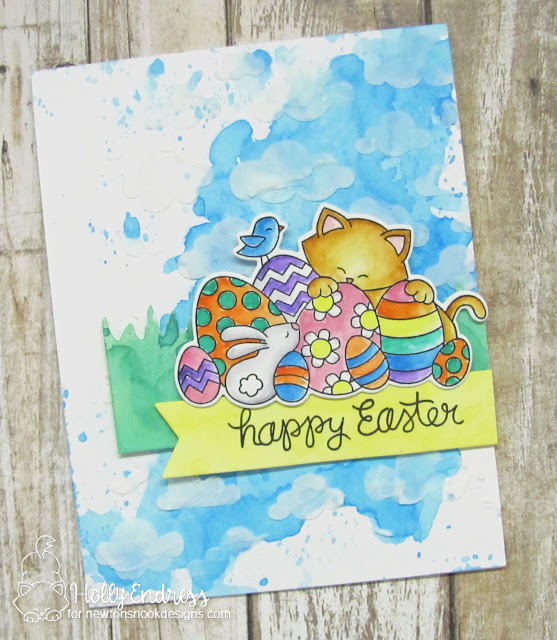 Love the sweet stamp and your watercoloring is awesome! This is a fantastic card ! I love your sky so much ! Beautiful cards! I love seeing Newton all decked out for Easter! Fantastic card! Love the clouds! Love the background on this fun Newton Easter card. Love this fun festive card and your gorgeous background.